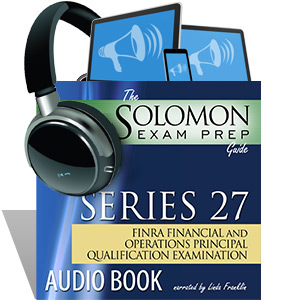 This 10.6-hour audio recording of The Solomon Exam Prep Guide to the Series 27 FINRA Financial and Operations Principal Qualification Examination will give you the content of this invaluable and enjoyable study guide in an audio format. After hearing the book’s well-written content, you will be even more prepared to tackle the Series 27 exam with confidence! The Series 27 audiobook is a great companion to the Series 27 Online Exam Simulator, the industry-leading online testing program that ensures you are learning and retaining the information. The MP3 files are compatible with all major MP3 players, including but not limited to:iPods, iTunes, Zune, Sony, MP3 CD Players, MP3 Walkman, Windows Media Player and QuickTime. I passed. Your Series 99 exam prep class was spot-on. Thanks! I love Solomon Exam Prep! The materials are comprehensive and simulate the type of questions on the tests. And the staff is so committed to their students' success. Without them, I wouldn't have been able to pass both the 7 and the 66.